Offers 360° syringe visibility. Model 007-635 Shown. 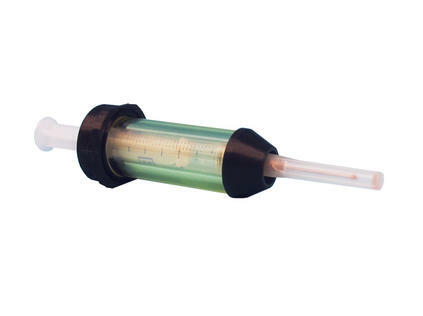 The High Density Lead Glass Syringe Shield reduces hand exposure from Tc-99m by more than 99%. The barrel of the syringe shield is constructed of optically clear high density (5.6) lead glass and offers complete 360° visibility. The end of the barrel is tipped with ABS Composite to protect it from breaking or scratching. Easy to use, the shield features quick and smooth syringe insertion with an 0-ring seal and an anti-roll cap.